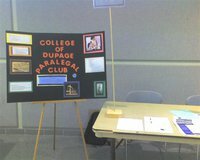 The ABA-approved College of DuPage (COD) Paralegal Program in Glyn Ellyn, Illinois, has a new blog, Paralegal Blog. At least it’s fairly new to me; the blog has been up and running since October 2010. This is the kind of project that I would love to see more paralegal programs take on. The COD blog regularly posts legal support staff jobs and internships available in the area. Paralegal students should read the legal want ads in the area where they want to work at least once a week throughout their entire education, and not just a few months prior to graduation. Working together as a group to find and post information about available jobs is a fantastic way for paralegal students to stay on top of local hiring trends. CDPC meets at cool locales, including my fave, Panera Bread. Free WiFi, green tea, and chocolate croissants – does life get any better than that? The group hosts guest speakers, and also had a paralegal portfolio presentation in December 2010, a great opportunity for students to show off their hard work and perhaps get constructive feedback. CDPC also blogs about the legal technology they are learning in various classes. If you are a student in a paralegal program, desiring to take your skills to the next level by organizing an active paralegal club, as well as learning how to blog and utilize other social media resources for professional development, taking a page from COD’s program is a good start. Other paralegal program blogs to check out include another Illinois criminal justice and paralegal program, Illinois Central College’s ICC Law, and Paralegal Programs Blog by Globe University/Minnesota School of Business. If you are aware of any other active paralegal program blogs, please send me the link.